Papa Murphy’s is one of those restaurant chains that change how you approach pizzerias. Most pizza restaurants ask their customers to order, sit, and wait; it’s the traditional route and there’s no real issue there. However, Papa Murphy’s is a take and bake pizzeria and that alone changes the game in so many ways. Take and Bake is a relatively new idea for many. It’s a system where the pizza is prepared when ordered, thus guaranteeing fresh toppings and sauce, but the customer has to bake it at home. It’s like buying frozen pizza at the supermarket except this time the pizza is 100% fresh and made with no additives or preservatives. As a matter of fact, Papa Murphy’s has changed the scene so much that it is now rated as the fifth leading pizzeria in the United States and has several branches outside the country as well. Barely any other pizzeria can compete with that level of excellence! Papa Murphy’s has a long and rich history. It originally began as two separate pizzerias. The first was Papa Aldo’s Pizza and it opened its doors back in 1981. This is often recognized as the primary company between the two that merged. The second was Murphy’s Pizza and this opened a few years later, in 1984. Papa Aldo’s Pizza originated in Hillsboro, Oregon while Murphy’s Pizza bloomed in Petaluma, California. For an entire decade the two chains continued to operate separately until Terry Collins acquired both in the year 1995. After the merge, the two became known as Papa Murphy’s International Inc., and it has been that way since. 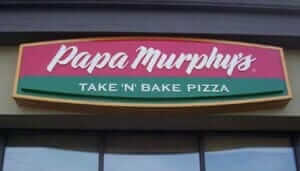 Papa Murphy’s main characteristic was that it followed a take and bake system. You don’t order and eat at Papa Murphy’s – you order then take it and bake at home. Because of this Papa Murphy’s pizzas were sold at lower prices when compared to other pizzerias and this gave it a strong advantage in the market. It also allowed Papa Murphy’s to offer their food to people with food stamps or EBT, a feature not many other restaurants in the country can boast of. It wasn’t until 2010 that ownership again changed hands. The company was bought by Lee Equity Partners of New York. By 2011 the chains grossed a total of over $702 Million and it reached $800 Million the next year, all from over 1,300 outlets spread across the country. In 2014, Papa Murphy’s went public is now available for public stock exchange under the NASDAQ tag of FRSH. When it when public in May, 2014 it was able to raise a total of $64.1 Million in public shares. Being a pizzeria there are a lot of select choices from Papa Murphy’s. However, there are three that many customers tend to agree are the biggest catches in the chain. Here’s a quick dive at those three pizza choices and why they are so beloved by customers. 1. The Herb Chicken Mediterranean – this pizza is an exquisite delicacy made of olive oil and garlic, sun-dried tomatoes, feta, spinach, herb chicken and zesty herbs atop artisan thin crust. This is one of the most often requested pizzas because of its healthy but juicy toppings. The words “pizza”, “healthy”, and “tasty” rarely go together, especially in that order but in this case they surprisingly do. 2. Chicago Style Stuffed Pizza – Chicago has been a city of renowned Italian pizzerias, small and big alike, from the 1920s to the present, and Papa Murphy’s respects that lineage of pizzeria elegance by offering the Chicago Style Stuffed Pizza. 3. The Cowboy – it’s traditional pizza but then again it’s not. It has all the usual toppings like sausage, pepperoni, sliced mushrooms, and olives atop a layer of red tomato sauce but it also has Papa Murphy’s signature herb and cheese blend that no other pizzeria can rival. It’s more of the same, traditional pizza but blended in such a way that it feels so fresh and different. Papa Murphy’s is one of the largest pizza chains in the country. With over 1,400 franchises in 38 states it is now the fifth largest in the United States. There is another fourteen up in Canada and three in Dubai. Since the company was acquired by Lee Equity Partners it has begun growing its franchising opportunities. As a matter of fact, in 2011 it ranked #5 on the Forbes list of top franchises to purchase. Another interesting little fact is that while Papa Murphy’s prioritizes take and bake orders, it does feature a call-in system where customers can call in their order and then pick them up through the drive-through. These are still unbaked pizzas but the service is much more convenient for people traveling. It’s also important to note that Papa Murphy’s does sell more than pizza; the chain sells cheesy bread, different kinds of salads, chicken wings, and lasagna among others.